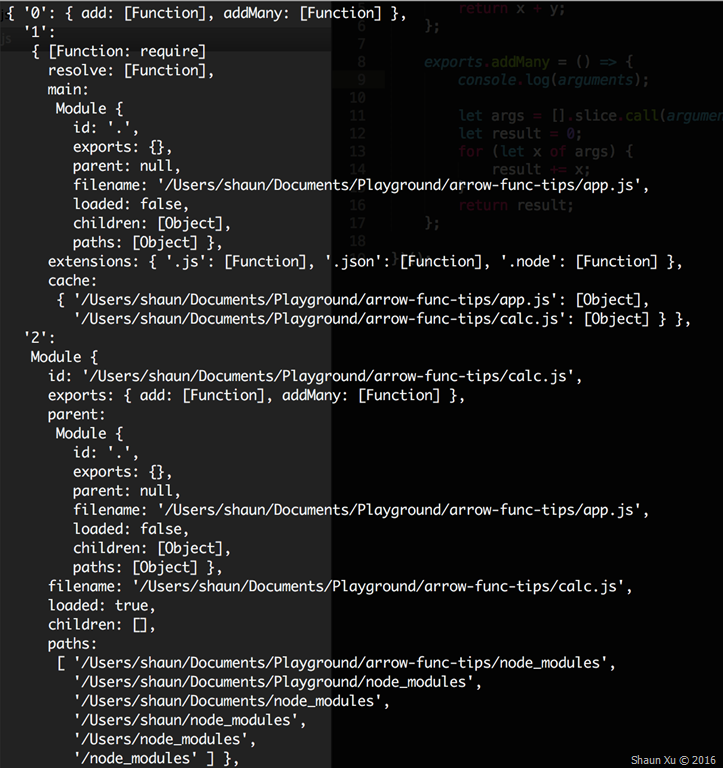 Assuming we have a module to add parameters, which is very simple. I'm using Arrow Functions to implement as below. Then I can use it as below. But when I ran this application I got an error below. 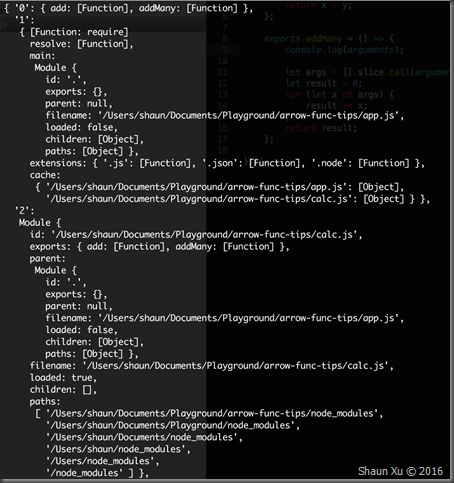 I'm using Node.js v5.7.0 which supports ES6 features. If we read Arrow Function specification carefully we will find that it captures the "this" value of the enclosing context, so the following code works as expected. This provides convenient to use parent "this" inside arrow function without needing to specify another variant to hold parent's "this" value. But the side effect is, it also captures the "arguments" value from the parent context. In my code I defined "addMany" function in arrow function mode. It copied "this" from parent context, which is the whole module, as well as "arguments", which is the module loading function arguments. To fix this problem, just simply define this function normally as below. It will use its own "this" and "arguments". Alternatively, if you are OK to enable one of Node.js ES6 staging features called "Rest Parameters" you can define the function as below, which allows parameters to be passed in as a real array. Then execute this application with Node.js options called "--harmony_rest_parameters". hi. I don,t now please tell me any one thanks for sharing this topic.